Nature has never failed to entice, enthral and entertain man. In different forms, shapes, colours and textures, each and every creation in nature has been and still continues to be objects of wonder for us. In our quest to enjoy and experience these wonders of and in nature, many of us undertake nature tours and travels. Trekking as these are popularly classified into, offer a lot more than the ordinary trips. These trekking trips come laden with the added advantage of not just bringing us closer to nature, but it gives us the unique opportunity to be a part of it. Flora and fauna differ in various parts of the globe and travellers who have an eye out for the surprises in nature, travel far and wide to learn, understand and enjoy this. There have been many nature travel and tour packages mushrooming at the major tourists destinations around the world of late. This trend has been seen as a positive change of attitude of the people towards nature and its elements. Preservation, prevention and conservation drives have brought awareness into the minds of people making them want to know more and more about nature and its hidden secrets and truths. Kerala has also taken that extra step to make sure that the nature loving tourists are well catered to. Trekking and adventure tour packages specially designed to get the travellers closer to nature have become a signature program of Kerala. When God’s Own Country opened its doors for nature lovers, the opportunities it offered the travellers were endless. Exploring and enjoying various avatars of nature in its own natural habitats and settings is something which all prefer. And when in Kerala you have the ample opportunity for this. 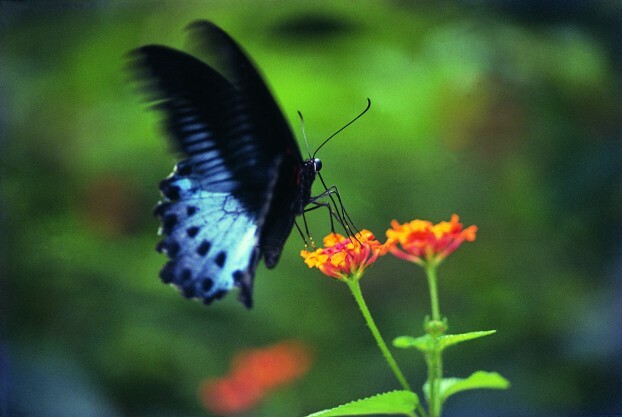 Kerala is home to almost 330 varieties of butterfly species. Found in the forests and also in the human dwelling areas, these flying flowers have opened up a new vista for tourism in Kerala. Many travellers come down to Kerala to study on the different butterfly species here. Being a storehouse of rare species of butterflies, Kerala has carved for itself a niche place among the destinations which offers nature tourism. The different wild life sanctuaries and national parks have the potential to serve as breeding grounds for butterflies making their population grow. Though found throughout the state, butterflies are found in abundance in the Western Ghats. These are places with dense plant and tree growth and also minimal human interference, making it ideal for butterfly population to thrive. The largest and the smallest butterflies in India are found in Kerala and that too near the Western Ghats area. The dense forests of Thattekad bird sanctuary, vegetation near the rivers and streams of Wayanad wildlife sanctuary, Athirappaly reserve forests, Neyyar wildlife sanctuary, the Ponmudi hillocks and the Silent valley National Park are rich in butterflies and have an exotic and an exquisite population of butterflies which offers an opportunity for research and photography. The large varieties of plants and flowers that grow in the forests of Kerala are also a major reason for such huge butterfly populations. Host plants and nectar filled flowers grow at all places in Kerala and that too almost all around the year. The moderate climate with more sunny days and intermittent rainfall makes the place a heaven for butterflies and in turn, the butterflies make the place more heavenly. The best time for watching butterflies is after the monsoons that occur twice each year in Kerala. They are also seen in plenty during middle of April, after the summer rains till May, before the monsoon starts. Any time between December and May can be considered to be apt for butterfly watching in Kerala. Large congregation of butterflies can be seen in the months of February and March when butterfly migration occurs. This article is authored by Syamnath JG who is one of the authors of the blog Ayurveda.